Everywhere you go nowadays, Christmas carols are being played on the radio, right? People are talking about their upcoming Christmas celebrations and vacations. Talking about the red letter days and holidays, Filipino buyers never fail to pick up the shopping cart and fill it up with presents for the Christmas Season. You may be running out of gift ideas this year as to where else can you get that unique gift for your family, friend and even your inaanak? 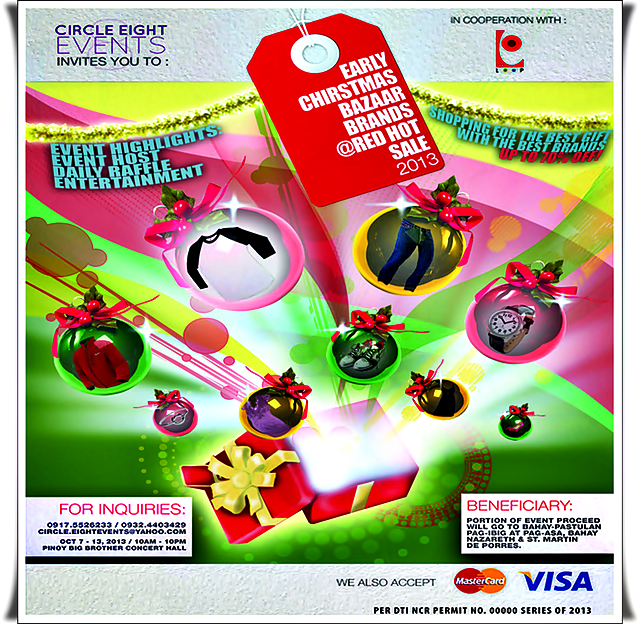 Panic no more as Circle 8 Events (CEE), an events management group invites everyone to the Early Christmas Bazaar Brands Red Hot Sale 2013. What started a couple of years ago as a small agency for events, that is now a corporation, CEE is initiating the sale as a way of giving back to the good times and successes. Happening from October 7 to 12, 2013 from 10 a.m. to 10 p.m. at the Pinoy Big Brother Concert Hall in Quezon City, the Red Hot Sale will house a wide range of brands that shoppers will surely love. Shoppers will enjoy up to 70% off on items. Uplift shopping experience as different entertainment visit the gift galore. And to even splurge on happiness, daily raffle encourages shoppers to increase chances to win exciting prizes. To ignite the drive for a good cause, portions of the sales will go to Bahay-Pastulan Pag-ibig at Pag-asa, Bahay Nazareth and St. Martin de Porres. These charitable institutions are housing elderly and street children respectively, giving care to those are in need of love and support. At the heart of Circle Eight Events is the outpouring of the affection for others, sharing the love for a greater reason.